One of the advantages of Laserfit is the precise control of the lens contour to match the eye. The lens surface is smooth when it needs to be but can also be made with micro-vaults for pingueculae and pterygia. A pinguecula (pin-GWEK-yoo-lah) is a yellowish, slightly raised thickening of the conjunctiva on the white part of the eye (sclera), close to the edge of the cornea. Pingueculae are non-cancerous typically yellowish bumps on the eyeball and typically occur on top of the middle part of the sclera between the eyelids and therefore exposed to the sun. They tend to occur towards the nose, but can occur temporally as well. There is typically a space between them and the cornea. When irritated they can become red and occasionally cause discomfort, especially in the presence of rubbing by a contact lens. Pingueculae are thought to be a result of exposure to sun and wind. A pterygium (tuh-RIJ-ee-uhm) is an elevated, wedged-shaped bump on the eyeball that starts on the white of the eye (conjunctiva and sclera) and can grow over the cornea. If you have more than one of these eye growths, the plural form of the word is pterygia (tuh-RIJ-ee-ah). Pterygia are benign (non-cancerous) growths, but they can permanently disfigure the eye. They also can cause discomfort and blurry vision. They also become red when irritated. If they grow into the cornea and threaten to cover the pupil, they need to be surgically removed. 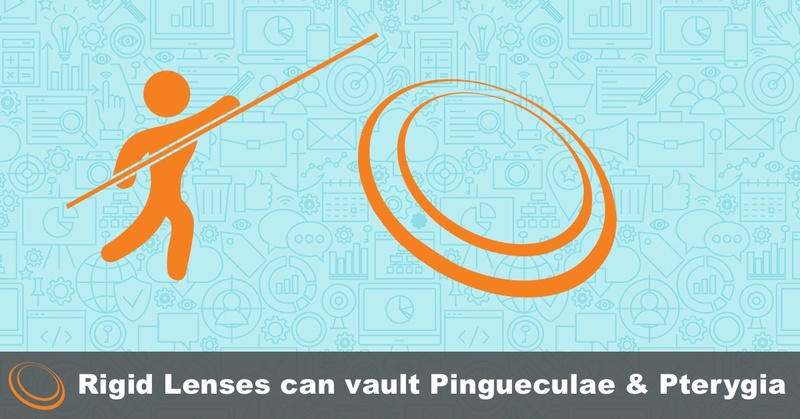 Scleral lenses can cause both pingueculae and pterygia to become severely irritated by compressing the lesions. This causes blanching of the blood vessels when the lens is worn. The resulting tissue hypoxia results in pain and rebound redness once the lens is removed. The common approach to fitting in the presence of a pinguecula is to either decrease the diameter of the lens to avoid contact with the pinguecula, or to cut a notch into the edge of the lens. 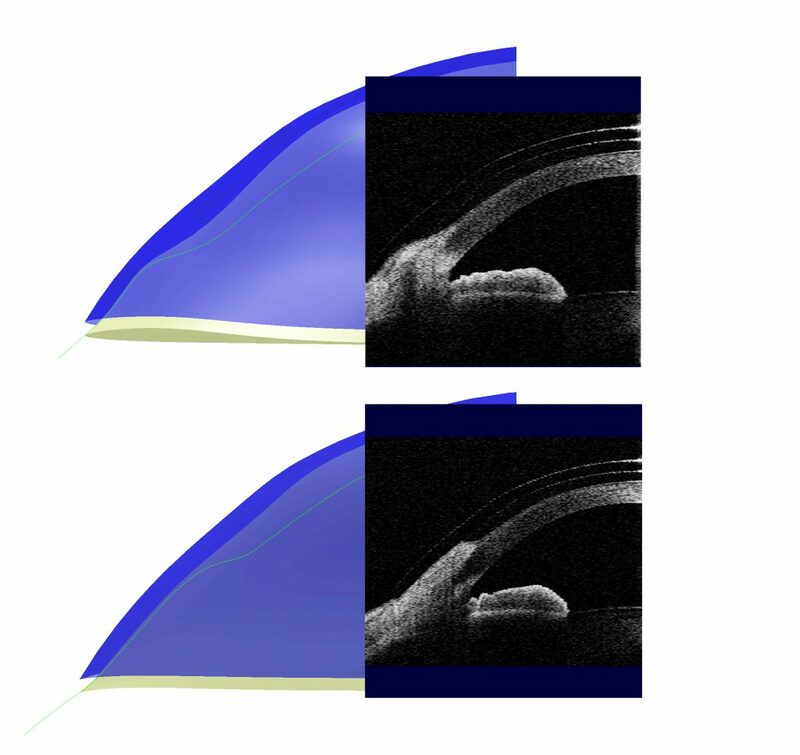 Fitting smaller may compromise the fit, and a notch may weaken the structure of the lens. The Laserfit approach it to create a surface bump to accommodate the lesion, thereby avoiding compression. The graphic shows two views of a patient with a pinguecula located on the nasal conjunctiva of one eye, and a pterygium-like lesion (probably a pinguecula histologically) located at the nasal aspect of the cornea on the other eye. The design view shows the contour of the lenses with respect to the eye surface contours. The corresponding OCT scans confirm how the lenses are precisely vaulting the lesions as worn by the patient. The patient reports no redness of the lesions after 4 hours of wear today.